Professional service and same day or scheduled pick-ups! 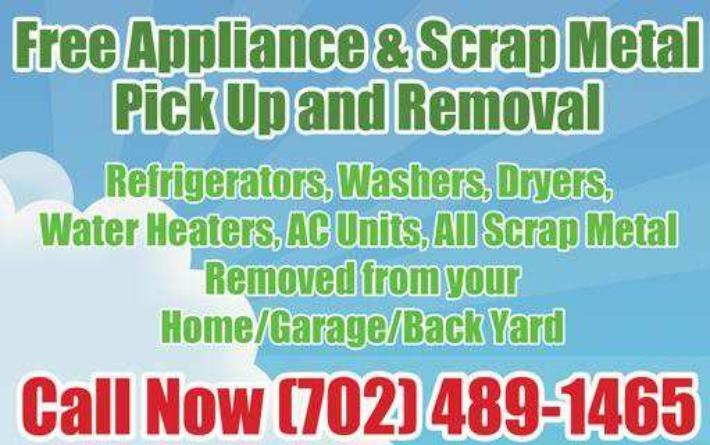 Call today for free pick up and removal of scrap metal and old appliances! The types of items we will gladly pick up for free are stoves, refrigerators, washers, dryers, water heaters, ice boxes, electronics, cabinets, HVAC units, microwaves, weight sets, metal pipes, old fencing, lawn mowers, bikes, yard scrap. We will pick up these items from your home, back yard, garage or place of business for free! Call and let us do all the hard work for you. We can also help with the installation of your new appliance (fee applies). We have had 1000’s of satisfied customers throughout the Las Vegas Valley!